Democratic presidential candidates, from left, Jim Webb, Bernie Sanders, Hillary Clinton, Martin O'Malley and Lincoln Chafee, take the stage before the CNN Democratic presidential debate in Las Vegas, Oct. 13, 2015. 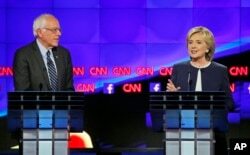 After watching Republican candidates spar in two rounds of debates, Democrats looking to become the next U.S. president got their turn Tuesday night at their first debate of the 2016 election campaign in Las Vegas. As the front-runner in the Democratic race, former Secretary of State Hillary Clinton was in the center of the debate, both literally and figuratively, as she stood in the middle of the four other candidates taking part. Former Secretary of State Hillary Clinton talks as Sen. Bernie Sanders of Vermont listens during the CNN Democratic presidential debate in Las Vegas, Oct. 13, 2015. Recent polls put Clinton ahead with about 40 percent support, while her chief challenger, Vermont Senator Bernie Sanders, came in at 25 percent. The first tough question of the night was directed at the front-runner. Clinton was asked whether she changes her views frequently just to get elected, as she changed her mind about the trade deal signed recently by 12 Pacific Rim countries. Clinton agreed that she had supported the deal while she was secretary of state but that after three years, when the deal was signed, it did not meet her standards. "Like most human beings, I do absorb new information,'' she said. Asked what was the most important issue facing the United States, the five candidates gave differing responses. Chafee chose the strife in the Middle East; O'Malley said the possibility of a nuclear-capable Iran; Clinton chose the global nuclear threat; Sanders picked climate change and Webb focused on U.S. relations with China and the threat to cyber security from the Asian giant. Clinton engaged directly with Sanders on gun control. She said pointedly that Sanders, who has voted against major gun control legislation, had not been tough enough on the issue. Sanders defended his record and called for better mental health services, stricter background checks and closure of the loophole that exempts gun show sales from background checks. Most of the candidates echoed Clnton's call that the "whole country stand up against the NRA [National Rifle Association]." "Enough with the emails," he said to a beaming Clinton. 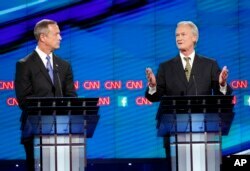 Chafee disagreed with the two. The candidate's "credibility is an issue,'' he said. In stark contrast to Republican race, the Democrats have spent far less of the campaign talking about each other, leaving Tuesday's debate as an intriguing forum for their policies and records to be compared and contrasted. Former Maryland Gov. Martin O'Malley, left, listens as former Rhode Island Gov. Lincoln Chafee speaks during the CNN Democratic presidential debate in Las Vegas, Oct. 13, 2015. The size of the field is another marked difference, with Clinton and Sanders being joined by former Maryland Governor Martin O'Malley, former Virginia Senator Jim Webb and former Rhode Island Senator Lincoln Chafee. The latter three candidates have struggled to earn even 1 percent in recent polls. That made Tuesday night important for them, since the Democratic National Committee has scheduled only six debates for its presidential candidates, half the number the Republicans will hold. The debate was perhaps the best chance for O'Malley, Webb and Chafee to establish themselves before the possible addition of another well-known figure in the race, Vice President Joe Biden, who did not take part in the debate but is still deciding whether to run for president. A new Reuters/Ipsos poll released Monday showed 48 percent of Democrats surveyed wanted Biden to join the race. If he were running, the poll said, Clinton would still be the leader, with Sanders running second and Biden in third, with 17 percent support.